In the course of my work I occasionally find a situation: management wants technical staff to be more assertive. That is, the technical staff feel they are not heard, but when we get down to talking, they often don’t know how to ask. 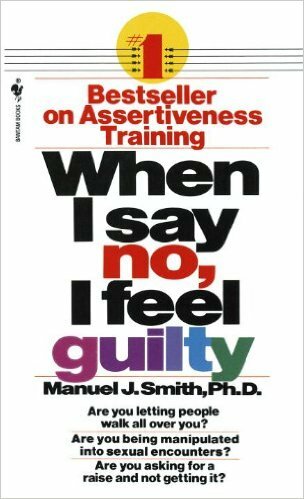 Today I’d like to talk about assertive communication, and how different it is from passive, using When I Say No I Feel Guilty as a sort of field-guide. Anything that ends with the phrase “I’m just saying” is probably passive-aggressive – it throws out an assertion while trying to hide the conflict. I’m reluctant to call this manipulation, because people who talk this way are not bad people; they’ve just been raised or trained by others who speak this way. When people “should” the typical response is to DEER – Defend, Explain, Evade, or Rationalize. The first two try to argue for a specific change, the second two try to avoid conflict. The problem is that DEERing gives the manipulator something to latch on to. Try to defend, and they’ll overpower you with reasons. Try to explain, and they’ll reject your explanation. Evading and Rationalizing don’t move the change forward that we are speaking to. And make no mistake, we are talking about changing behavior. Either the bugs get fixed or they won’t, either we work the weekend or we don’t, either we ship to production today or we don’t. So what is the alternative to DEERing? You could think of an argument as a verbal fight. In some martial arts, the object is not to defeat the enemy, at least not initially, but instead to tire them out, often by getting the other person to use their own force against themselves. Manuel Smith, the author of When I Say No I Feel Guilty suggests four tactics – the first three tire out the opponent, the fourth pushes for a change. The moves are Fogging, Negative Inquiry, Negative Assertion, and Broken Record. Let’s take a look at them. Negative Inquiry – Force them to expend energy explaining the manipulation. “Why would shipping a day late us unprofessional?” or “Why would me leaving at six o’clock make me not a team player?” Often, they’ll just throw another judgement at you, that you can either Fog or negative inquire with. Finally, once we have deflected each comment, we come back to our goal. Broken Record – “And I want the bug fixed.” Not we should. Not it is professional. Not, the customers want it. Instead, this is pure, raw, I want it. That is assertive communication. Many of us argue for a change by suggesting what the world should be. To defeat us, the other person simply needs to take each of our points and derail it. Assertive communication is different, because it is about what we want, not what “should” happen. That is different than aggressive communication, where one person advocates for their needs in a way that violates the rights of others. The book When I Say No I Feel Guilty doesn’t just define these terms. It also gives step-by-step examples of many long conversations in these styles, with everything from returning a defective piece of furniture to work and family issues. Maybe today you don’t buy a whole book. Instead, observe conversations you “lose” and conversations you “win” to see if you are using passive methods — and how the are working for you. If they aren’t working for you, maybe it’s time for a change. Hi Matt, I've found too often that assertiveness is confused with mechanical kneejerk "No!" I prefer to think of it as a thoughtful way of responding, as opposed to simply capitulating, that can lead to a win-win rather than the win-lose depicted. Good piece, Matt. There's certainly a difference between assertiveness and aggressiveness - the latter of which is more common in IT circles. They both revolve around self-esteem - a lack of which tends to inhibit the former and foster the latter.